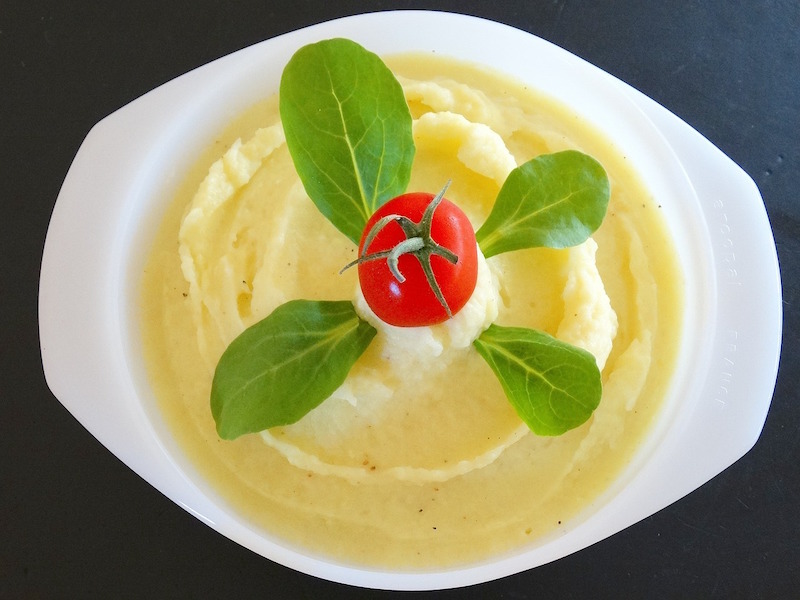 These mashed potatoes are a simple, luxurious indulgence. They are rich enough to enjoy in small portions. There are lessons to be learned in the care with which Francesco selects and handles ingredients, including the everyday potato. His scrutiny of raw materials is typically Venetian. Shoppers in the Rialto market are extremely demanding and often wind up discussing the fish or produce with the seller or with perfect strangers. “Idaho potatoes are the ones I prefer for mashing,” says Francesco, “because they have a light, dry texture. 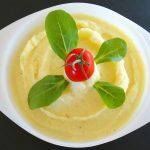 But it is important to cook them unpeeled to keep the starch in and then peel the mash them while they are steaming hot, before they become glutinous, even at the risk of burning your fingers.” He uses a clean towel – a chef’s answer for a pot holder – to cradle the potatoes and protect his hands as he peels them. And an old-fashioned ricer, the kind of gadget that forces the potato through little holes, is best for mashing. Boil or steam the potatoes until they are tender. As soon as they are done, peel and mash them, preferably in a ricer. Mix in the butter with a fork. Heat the half and half until bubbles begin to form around the edges, then add it to the potatoes, mixing well. Mix in the Parmesan cheese and season with salt and white pepper. Serve at once or transfer to a buttered casserole, dust with additional cheese, and reheat for 15 minutes in a 350 F (180 C) oven.